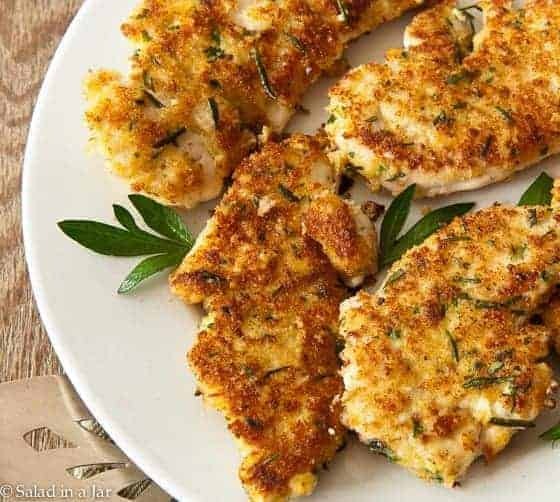 These breaded and lightly seasoned Goofproof Chicken Cutlets are so flavorful and crispy, you won’t miss the gravy or the Colonel. 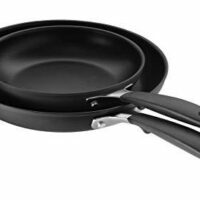 Pan-frying yields maximum flavor without heating the kitchen up too much. One generous serving of this chicken (based on 4 servings) is only 300 calories. But that’s not bad when you can still get golden brown color, delicious seasoning, and a crunchy crust. Speaking of seasoning, the original recipe warned NOT to make any substitutions for the fresh rosemary. I concur. Seems like a great excuse to plant your own rosemary bush if you haven’t already. The only drawback with this recipe for Goofproof Chicken Cutlets is that the chicken (and definitely the fish) is best cooked at the last minute. But if you prepare your crumb mixture ahead of time, it won’t take much longer than 10-12 minutes from start to finish. Since I mentioned fish, I should tell you I tried this with tilapia last night, and it was a hit with my family. As a result of the fish being relatively thin already, there’s no need to pound it first like the chicken. But in every other way, follow the directions just the same. Place chicken pieces into a plastic bag one at a time to prevent any splatter or flying pieces; press the air out and seal. Pound chicken with a mallet or palm of your hand until approximately 1/2 inch thick. Tear up bread and place in the bowl of a food processor or blender along with cheese, parsley, and rosemary. Pulse until finely chopped. Pour crumbs onto a flat plate. Beat egg and egg white with a fork and pour into a pie plate. Preheat large skillet and add half of the oil. Oil is ready when it glistens. Dip each chicken piece into egg mixture, then coat both sides with crumb mixture, pressing lightly to make sure surface is completely covered. Shake gently to release any excess crumbs. Lay in hot skillet being careful not to crowd pieces. Cook for 2-3 minutes until golden brown. Flip and cook other side until it is also golden brown. Remove cooked chicken to serving platter and add remaining oil to skillet. When oil is ready, cook remaining chicken. Serve immediately. This recipe is in my bookmark …this the only one that make cutlet crispy. I’ve been using this recipe dozens times ..thank you !!!! Have made this .. and it’s delicious! Going to try with cod fillets tonight. I want to try baking these.. What do you suggest? Bake at 350 for 20 minutes? Thanks so much for this recipe I well let you know how it goes over. Looks great, I need to try it like this with rosemary in the coating! This looks so delicious! I am definitely going to have to add this to the menu in the near future. I have a loaf of homemade whole wheat bread that didn’t quite rise all the way so I’d planned to make it into breadcrumbs anyway–this will be a great way to use some of them up. And so glad my MIL sent home a rosemary plant for us to plant–hers are so big they are like bushes! I never tried to make my own breadcrumbs, I’m usually a little lazy on that side of things. I didn’t realize it was that easy. This looks so good! I’ll have to try it out soon! I have some talapia in the freezer and have been trying to come up with a new way to fix it. I’m going to give this a try. Your recipes always come out fantastic for me. I need to get in the habit of reporting back to you when I try them! Thanks, Paula! Flavour wise, you can’t beat adding rosemary to chicken. The Parmesan is a wonderful addition as well. I’ve done a recipe very similar to this one but never with fish. Thanks for the idea, my husband will enjoy it. Chicken cutlets are a favorite at our house too. And a piece on a bun with a few pickle slices is very similar to Chick-fil-A’s delicious sandwich. A little red sauce and a slice of Mozzarella and then you have chicken parm. Your addition of fresh Rosemary would be extra special for John! That picture sucked me in. It looks delicious!!! I’ll have to put it on the menu this week. Luv when fast + easy = delicious!